Wienerschnitzel has rolled out a limited-time dipped cone flavor and daily $1.99 deals. The new dipped cone flavor — cake batter — will make every day seem like a birthday party. The cake batter-flavored shell even includes rainbow sprinkles! 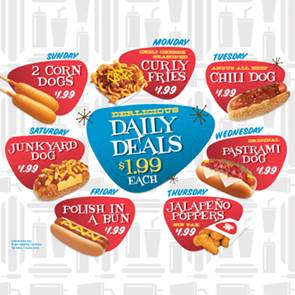 The daily $1.99 deals include a mix of hot dogs and sides. Slater’s 50/50 might be the chain to have pioneered the bacon/ground beef burger patty, but Jack in the Box is taking it nationally. 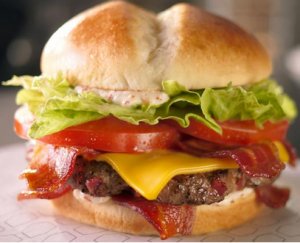 The fast food chain has just introduced its Bacon Insider burger, which features a brioche bun with the aforementioned combo patty, sandwiched between six slices of bacon, slathered with a bacon mayo and topped with lettuce, tomato and American cheese. In other words, it’s a bacon lover’s dream. The Year of the Horse begins Friday (January 31), and Panda Express is celebrating by giving its guests a free order of Firecracker Chicken Breast, with the coupon available here. You can either print the coupon or simply show it on your mobile device. Firecracker Chicken Breast (chicken breast, sweet red and yellow bell peppers, and onions tossed in a wok with spicy black bean sauce) will be available through February 18. Guests dining at Panda on Friday will also receive a traditional red envelope, with a special surprise offer inside. Our pal Allan Borgen from the Let’s Dine Out show and FeedMe411 has shared another great deal with us. He has posted a coupon good for 20% off lunch or a free dessert with dinner at Mustazzoli Ristorante Italiano in Ontario. All you have to do is click here and print out your coupon. Easy peasy. Mustazzoli Ristorante Italiano is at 1845 E. Holt Blvd. The iconic Ruby’s Diner will celebrate its 31st anniversary by giving a gift to its fans. On Monday (January 27), diners at Ruby’s can get a Rubyburger with fries for just $3.10. The deal is good from 11:30 a.m. to close. But that’s not all. Guests dining on Monday will also receive a card good for a free Rubyburger with the purchase of an adult entrée any time between Tuesday (January 28) and February 13. Turns out Pick Up Stix isn’t the only one gearing up to open in the new section of Upland’s Colonies Crossroads. Chipotle is also interviewing prospective employees this week. It appears that Pick Up Stix may be the next restaurant to has joined Panera Bread in the new section of the Colonies Crossroads in Upland. The chain is looking for experienced cooks and cashiers. Open interviews will be held from 2 to 4 p.m. tomorrow (January 23) at the new location, 1053 E. 19th St., Suite B. For more information, including a link to download a résumé, click here. Update: Did a drive-by today and discovered that the new location is already open!